While I’ve never bothered to complete the papers needed to renew my passport, I still love the idea of traveling – preferably by train, second by plane, but much more affordable by mind. So, Mondays will a blending of a few things (in this case, a page from two calendars, from another, a title to a rambling). 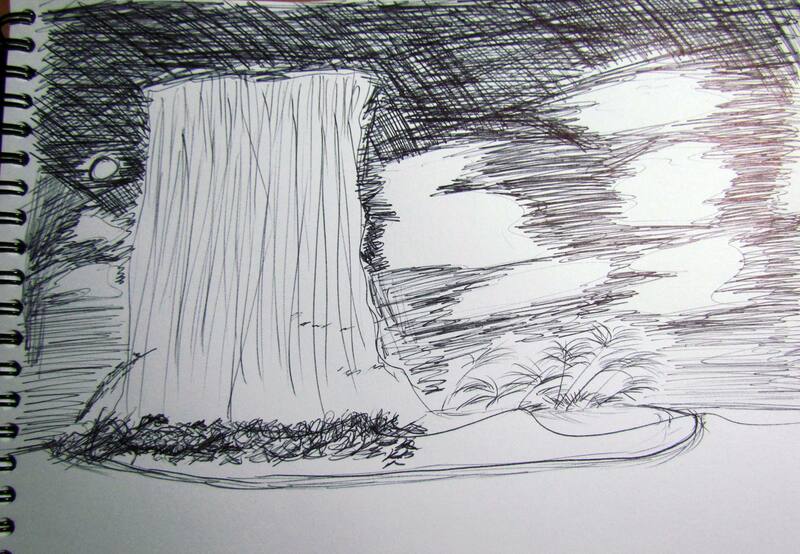 This entry was posted in Play and tagged art, cook island, devils tower, doodling, pen, play. Bookmark the permalink. Traveling by the mind is now my travel option of choice. I do wish there was a way to have seen Snoqualmie Falls other than by video yesterday. Wow! I hope all is okay on your side of the mountain. Yes I Tweeted. Agreed – the Falls was definitely impressive from a distance. Today’s fog prevented any sight of it today, despite the patches of clear skies.